June 23, 2017 - Video captured a playful young hippo relentlessly pursuing a crocodile around a watering hole in Hwange National Park in Zimbabwe. 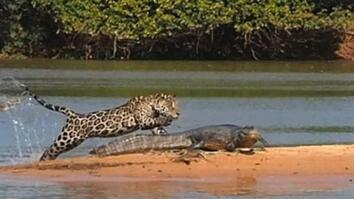 The crocodile made several attempts at escape but the curious mammal continued to give chase. 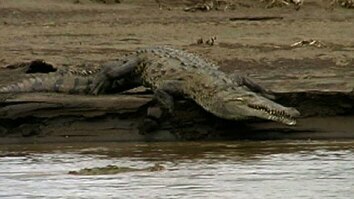 Crocodiles often prey on hippo calves but the reptile did not show any signs of predation nor did it fight back. The reluctant playmate eventually made its way to a herd of elephants that scared away the young hippo. Read "What Happens When a Baby Hippo Plays With a Croc." A crocodile is receiving some unwanted attention from a young hippo. The reptile is seen here being chased around a waterhole trying to find a way to escape. The hippo probably just wants to play because it’s not showing any signs of aggression. The interaction is unusual because hippos most often play within their own species … and crocodiles often prey on hippo calves. However, this predator wants to be left alone than catch a meal. 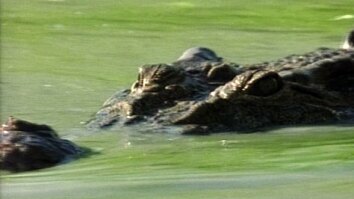 Eventually the crocodile gets its wish … when a herd of elephants chase away the hippo.